UN INCONTOURNABLE – Proche du Champ de Mars et de la Tour Eiffel, le restaurant Le Blavet vous propose le midi et le soir une cuisine traditionnelle dans un décor classique, élégant et intime. EXCELLENTE CUISINE FRANÇAISE – Ici, vous pourrez choisir entre deux menus complets : une entrée, un plat et un dessert. Les plats sont goûteux, élaborés avec des produits frais et les desserts originaux et variés. Dégustez les œufs cocotte au foie gras et champignons ou le magret sauce au miel accompagné du gratin dauphinois. 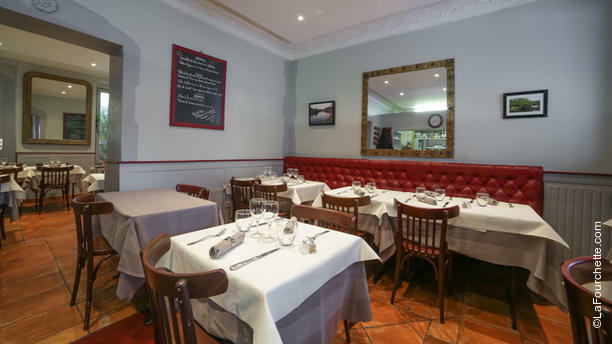 POUR TOUTES LES OCCASIONS – Le restaurant Le Blavet se prête aussi bien à un repas d’affaires, en amoureux ou en famille : l’ambiance est conviviale et charmante. L’accueil et le service sont irréprochables. I love this restaurant. I always come here when I am in town. Make sure to have a reservation. The duck is fantastic and the wine is delicious. It is a very pleasant dining experience. for! The food was fantastic, and choices were not the standard fare! My wife and I had crawfish and shrimp ravioli in a cream sauce to start which was amazing; her main course was a filet of beef au poivre that she loved and mine was fricassee of sweetbread that was different than anything I have had in years, and wonderful. We finished with an open apple crepe that also was excellent.There were two choices of set menus and well priced food and wine. The service was so perfect, and we were treated so well despite our stumbling French. I would come back if we weren’t returning to Chicago! Next trip for sure! The food was excellent. The portions were very large. We will definitely return. We had an excellent meal. The portions were HUGE and I felt bad for not being able to eat it all. The deserts were unbelievable as was the main dish. Appetizer was enough to split. Simple restaurant but cozy and inviting. Nice food and good offerings with several menus and day specials. Not too much offerings in the menu which makes it easy to pick. It was not busy in the restaurant on this Wednesday so the food can every quickly and looked and tasted very nice. We where with a group of 6 and had a very nice evening in Le Blavet. Great place, great food, and very accommodating with a baby in a stroller. Thank you for a good evening! The set is very worthy of the price. We definitely will go there again! Good is good and the price is reasonable! Best french restaurant I've ever been! !